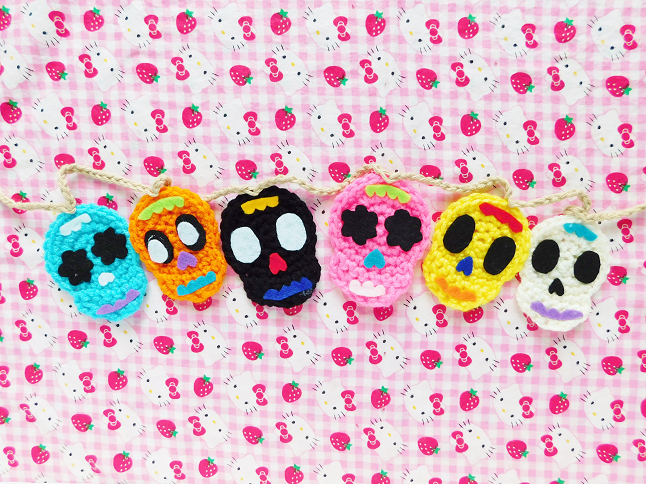 Today I have another crochet pattern for you guys. 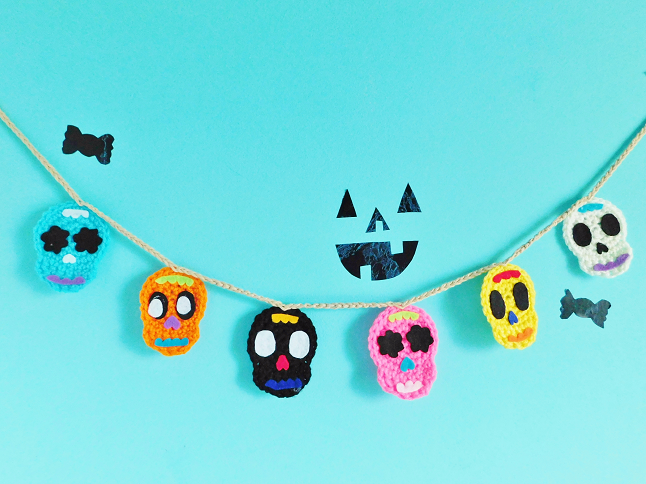 This time I am showing you how to make skull garland perfect for Dia de los Muertos aka Day of The Dead. Even though I am Mexican-American I have actually never celebrated Dia de Muertos even though I have always wanted to because it sounds like such a beautiful holiday. Anyways, I hope you guys enjoy this DIY because it's easy and you can customize it however you like. 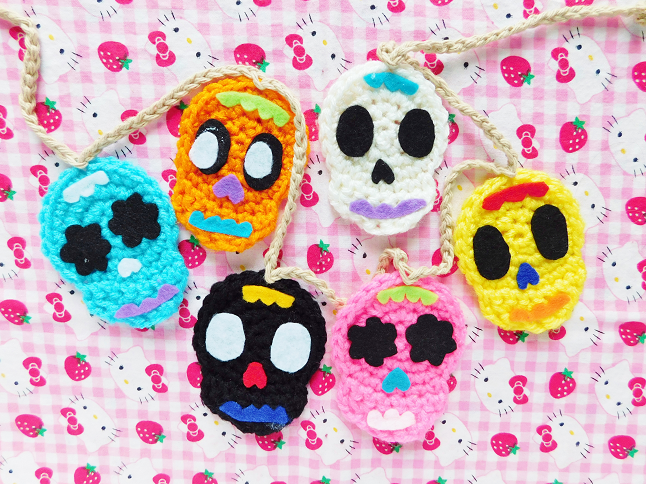 A little history on Day of the Dead: Dia de los Muertos is a 3-day Mexican holiday (October 31 - November 2) where people gather together to celebrate their family and friends how have passed away. They hold festivals, go to cemeteries to pay respect to their loved ones, make Mexican food (the favorite foods of their dead relatives), and put up colorful decorations. A common decoration used to celebrate Dia de los Muertos are skulls they even make sugar skulls and pan de muertos (dead bread), a sweet bread that looks like twisted bones. Cut off, weave in ends. Repeat as until you reach as many skulls you want. Time to decorate! 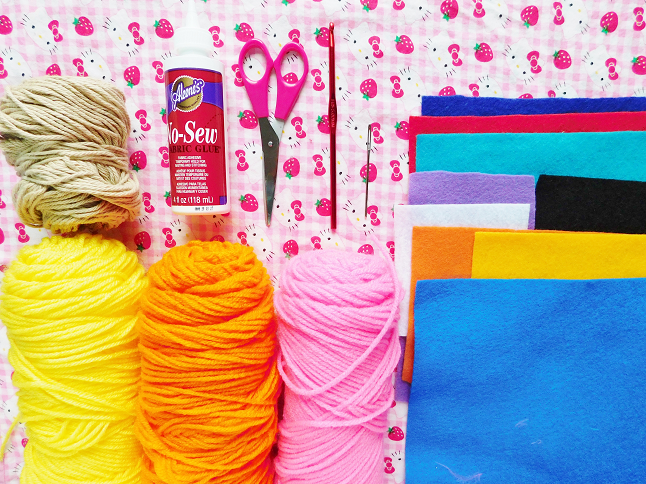 I cut out various pieces of felt, the more color the better! I could've gotten into more details but I was happy with how they turned out with just the felt. 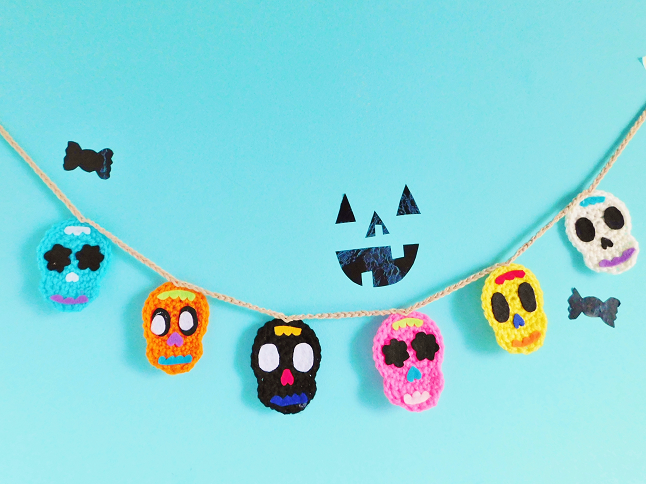 Glue the felt to the crochet skulls and wait for them to try. 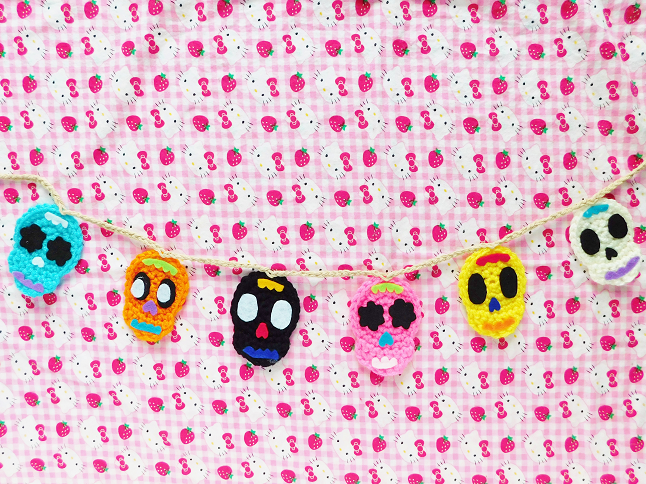 To attach the skulls together start with a beige colored yarn (or twine). Ch 10 sts, slst to form loop. Sc 20 sts, slst to one skull. Sc 15 sts, slst to another skull (repeat until you reach the last skull). Sc 30 sts, slst to the 10th st to form another loop, cut off. Tie knots around the loops to secure and you are finished! These are so pretty! You're so skilled at crocheting hun!